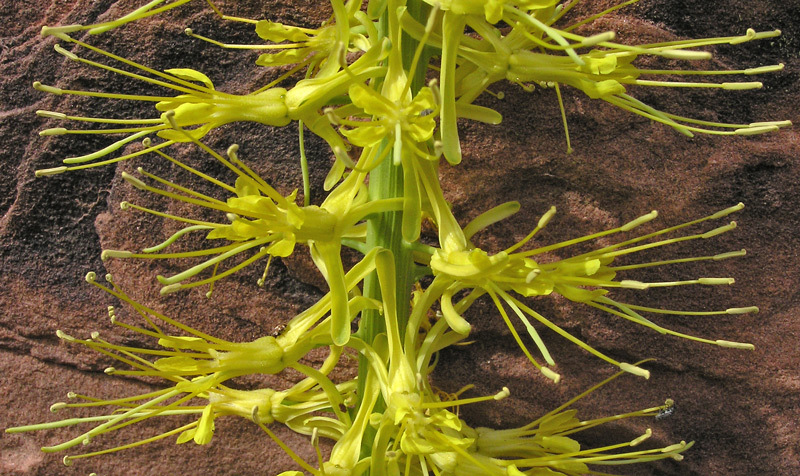 Click for a full sized view of a magnificent bloom of Stanleya pinnata. Semi-desert, foothills. Woodlands, openings. Spring, summer. Lower Cross Canyon, May 2, 2016 and March 26, 2017. 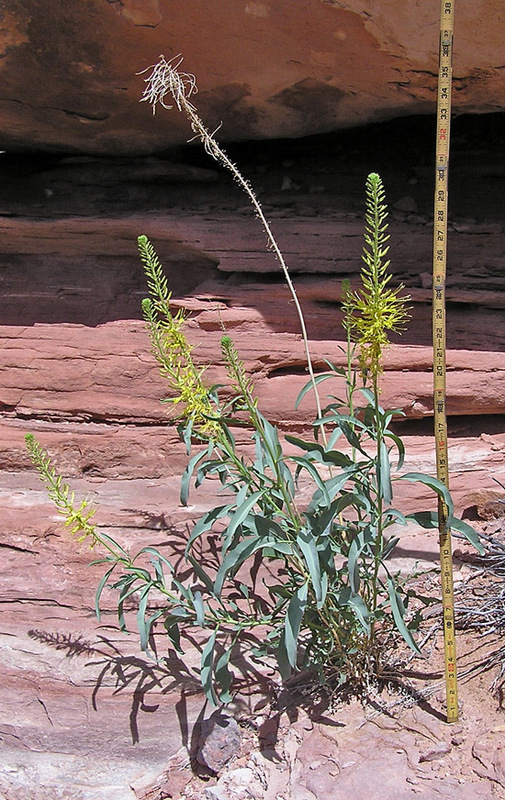 Growing to over five feet, putting out a long plume of yellow flowers, and swaying in the wind gets you attention. Place yourself in rocks at the side of the trail and the show is yours. Stanleya pinnata flowers are a deep lemon yellow. They open from the bottom of the flowering stem upward over a period of many weeks, sometimes months. 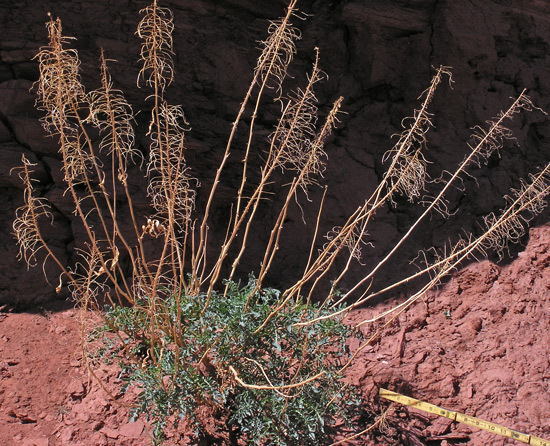 The dried stems persist for a year or two. 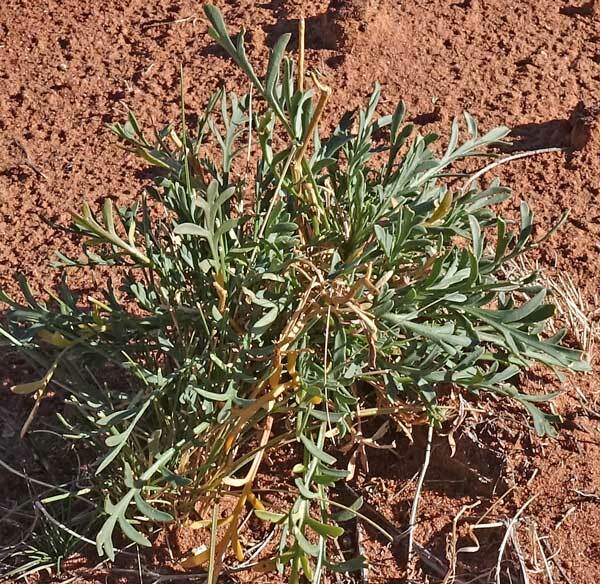 Stanleya pinnata thrives on selenium rich soils and as a result, crushed stems or leaves may have an unpleasant odor. The young plant in the second photograph shows off the several leaf shapes of Stanleya pinnata: lower leaves are deeply cut into lobes or they may even be cut so deeply that they are pinnatifid or pinnate. Upper leaves are reduced in size and they also may have a new shape -- linear, linear/lanceolate, or ovate. Frederick Pursh was the first to name this plant, but he placed it in the Cleome genus, giving it the name of Cleome pinnata in 1814 from a species collected by John Bradbury (1768-1823) "in Upper Louisiana [Territory]". "Pinnata" is Latin for "feathered", referring to the feather-like, dissected lower leaves. 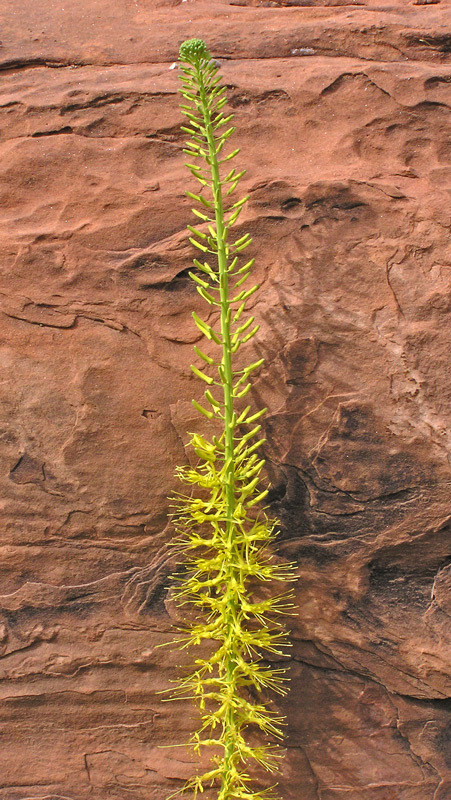 Along the Colorado River, Utah, April 13, 2005. Sepals are reflexed; petals are united at their base then narrow into individual segments and then broaden; six stamens (curling as they age) greatly protrude; and the style is long and club-like. Kane Creek Canyon, Utah, March 15, 2007. Flower stalks persist for a year or two and make Stanleya pinnata easy to identify. New spring highly dissected (pinnately lobed) basal leaves add to the ease of identification. Notice in the top photograph that the upper leaves are not pinnate. Click for a view of a massive bloom of Stanleya pinnata.